THE 180: You started your career at PS 226, but then you went elsewhere for a bit. What brought you back to PS 226? GLADYS MILLER: I worked here for eight years, and then went to PS 30 in Manhattan. There, I taught primarily third, fourth, and fifth grade inclusion. I myself am a parent of a child who has autism, and so due to his needs and his bussing it was beneficial for me to return back to the Bronx. I remembered that when I worked at PS 226, it was a really good school, it’s where I learned basically everything I know about working with children with special needs, so I decided to return back. THE 180: Do you feel like it is still very much the environment that you left so many years ago? GLADYS MILLER: It is. There are some changes, but I like the location and the population of students. It’s very challenging, but I feel like I’m learning a lot. I’m learning from the students themselves, from Turnaround, from my administrators, and I have a special mentor that comes in from the state and she’s great. THE 180: You said you are learning from the students. What are you learning from them? GLADYS MILLER: Yes, students are the best teachers. [Laughing] You learn a lot about yourself – what areas you need to improve, what is working and what is not working. I watch how my students’ behavior changes, then I look and I say, okay well this worked or this did not work, let me not do that again. And I can see just by their responses. Something that worked for one child, might not work for this child. Now how am I going to change it so that this child could be successful? THE 180: Rebecca mentioned that you have been working hard with establishing classroom routines and building a sense of belonging in the classroom. Why is that so important? 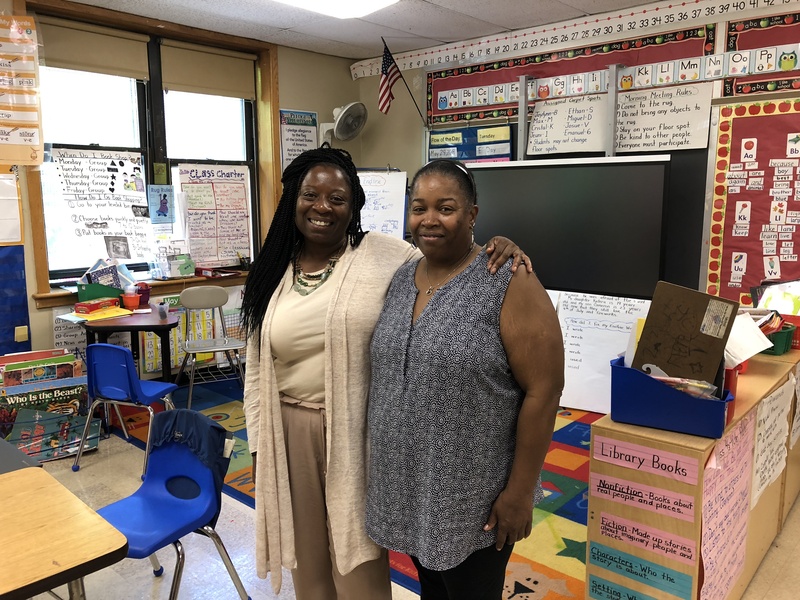 GLADYS MILLER: I think that it is very important because when I first started in September with the children they knew each other from the previous year, but they didn’t get along with each other. And I realized that in order to teach the class, I first had to have the kids get along with each other, or at least respect each other enough to not fight with each other. How am I going to get these kids to like each other and not fight? It’s a social issue, so I had to find ways to get them to socialize with each other, learn rules and routines and reward them along the way. I did this through having them have frequent five-minute brain breaks where I’d say, “okay we’re going to have Play-Doh time, or we’re going to have coloring time, or we’re going to have a game.” And through those type of activities the kids learned if they want to have a game or be able to participate, these are the rules of the game. I have one student who usually acts out, and he said to me one day, are we going to get a break? I said, in a few minutes. And he said, well how many minutes? Can you time it? I said in ten minutes I’ll give you the brain break. And he said, okay because I’m tired of working and I feel like running around the classroom. [Laughing] So I put the timer on and he was able to sit for the next ten minutes because he knew that when the timer went off he was going to be able to get a brain break. 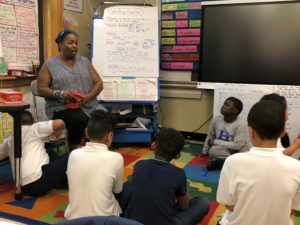 THE 180: What excites you the most about the partnership between PS 226 and Turnaround? GLADYS MILLER: I find the Turnaround staff to be very friendly and very helpful. Whenever I need help from any of them – if I need to talk to them about a student – they come into my classroom, talk to me and give me suggestions. They have not been judgmental. And I really enjoyed the [professional development sessions] we have on Mondays – they give us reading materials and activities so we’re up and moving around. I find it very informative and very helpful. THE 180: What Turnaround for Children strategies do you find yourself using the most? GLADYS MILLER: The reminding, redirecting, reinforcing language. Just the language. I use it a lot, and it works. Kids love to be reinforced, so when I see them doing something that’s positive I say, “Wow, I really like the way you were able to sit down and calm yourself down.” I name exactly what it is that they did which reinforces the behavior that they did. And then the other kids listen and they’re like, oh maybe I should sit down, or maybe I should listen. THE 180: What achievement are you most proud of this year? GLADYS MILLER: Definitely student behavior. In the beginning, it was very difficult to teach class because [students] were acting out and fighting. I am really happy to see that the kids are not fighting. Now the classroom feels safe, and that was a big thing for me. I wanted the kids to feel safe, and I wanted them to feel like they can come to school and have friends. [They know], “I may not get along with everyone, and I may not even like everyone, but we can still treat each other with respect. THE 180: What do you think is the most important thing that students need to succeed? GLADYS MILLER: I think the most important thing that a student needs to succeed is believing in themselves. A lot of my kids in the beginning, would say, “Oh, I don’t know how to do that.” Once they became successful, even if it was something small, I would celebrate what they did and I would say to them, “See, you tried.” I tell them, it doesn’t matter so much at the end if you have the right answer, what matters is that you tried. So now the kids will try even hard work. Even if they haven’t gotten it right, I can show them how much they got correct and they feel happy because then they are successful in some part of the work.